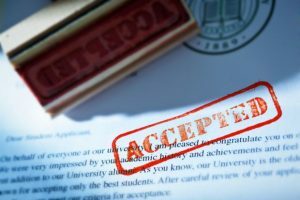 Applications to get into a university in the UK is dependent on whether you want to study a postgraduate or undergraduate degree. The Universities and Colleges Admissions Service is in charge of all applications to UK universities. You just have to go to their website and fill in a UCAS application form. It is important to make sure your application is in place before the deadline. Registration: This is the first step and it’s quite simple. Register all your details correctly with UCAS and you can go on to the next. Choose your course: This is probably the most important stage. You need to identify a course you want to study. If you need help in choosing a course, the CUG Course Chooser will help you find the right one. Select a university: There is only one way to enjoy the course you want to do: find the perfect university for it. The league table is not the only thing you should consider before making a decision. Think about the location, accommodation and facilities. Availability is also something to consider, as there are sometimes limited spaces in most schools. Fill out the form: You will be able to apply for five different courses at one university for the same course, or to five universities for one course. After this, you can submit the form, and expect to hear from the university. Non-EU applicants: The UCAS accepts applications from non-EU applicants at any time between the 1st September and 30th June. However, applying earlier will give you plenty of time to take care of immigration, travel and accommodation. EU applicants: EU applicants are expected to have their applications received by UCAS on or before January 15th. You will be treated as a late applicant if this date is not adhered to.